Spanish energy engineering company Norvento has begun conducting validation tests of a new offshore wind turbine prototype. 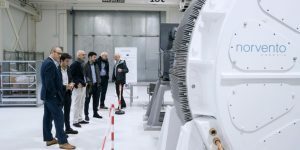 According to Norvento, the prototype represents a more efficient and smaller generator that allows the reduction in the weight and size of offshore wind turbines. The prototype is being tested in the technology premises at Norvento Enerxía Innovation Centre (CIne) in Lugo. Magnomatics is in charge of the design and manufacture of the turbine, Seaplace has developed a floating platform and Norvento contributes with its expertise in the use and design of electrical generators and wind turbines. The Spain-based company will also test the technical requirements and the real performance in its testbench in the technology premises. The project is part of the Compact Holistic Efficient Floating Turbine (CHEF) project, which aims to reduce the cost of the energy produced by offshore wind turbines, improving their efficiency and reducing costs.